This leaf comes from one of the greatest 12th-century English manuscripts, written at Christ Church, Canterbury, and known as the 'Eadwine Psalter' because it has a full-page portrait commemorating a monk-scribe called Eadwine. It was based closely on an older Christ Church manuscript, now in the British Library (Harley MS 603). Three other similar leaves with an exceptionally long series of biblical scenes are in New York and at the V&A Museum; taken together the Old Testament is represented by a series of scenes from the lives of Moses and David, and a much more detailed New Testament narrative. 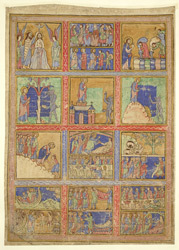 The verso of the Library's leaf covers the first part of Christ's adult life, with his Baptism, the Marriage Feast at Cana, and his Three Temptations, followed by several of his miracles.